I actually don't know much about his story, I don't even know his name. I was rushing around, running late for my photography course in the city, when I saw this man and couldn't look away. His face was so captivating and enthralling. 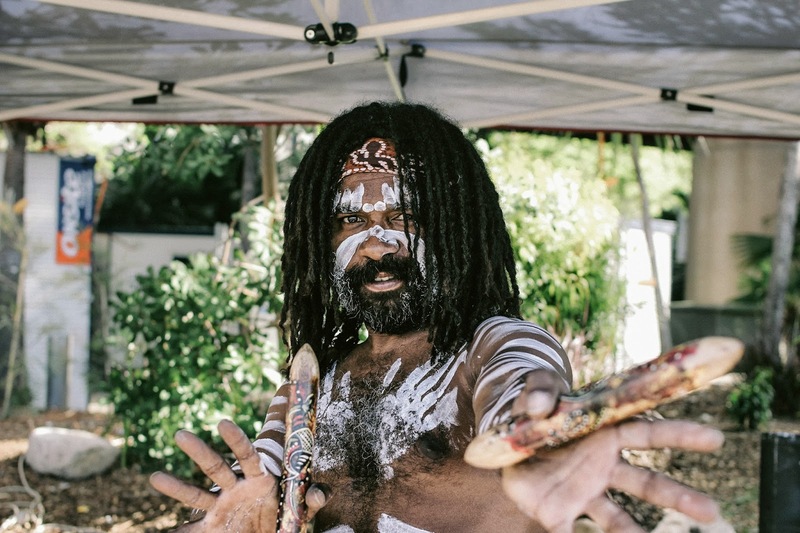 He was dancing around, hitting his sticks in time to the beat of the didgeridoo being played by his 'brother' on the ground beneath his feet. He was chanting beats and sounds that resonated with me for the rest of the day. It was beautiful. I wish I had time to sit down with him and ask him more about who he is and what he stands for. Perhaps I can return and ask him all my questions. Perhaps I'll never see him again. As for this man, I'm sorry to say I can't share his story for you, only his portrait. I think in his instance though, that is enough. They say a face can speak a thousand words. What does his face tell you? This is a great portrait, and it's fun to imagine someone's story anyway! This sounds like a wonderful project you're starting, and I can't wait to see more!